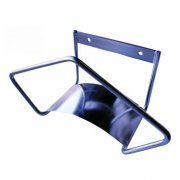 Stainless steel hose rack (electro polished) for 25m 1/2" hose or 20m 3/4" hose. Stainless steel (304) hose rack for 40m 1/2" hose or 30m 3/4" hose. 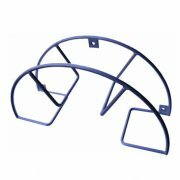 Stainless steel(304) hose rack for 60m ½" hose or 50m ¾" hose. Stainless steel automatic hose reel for 15m 1/2" hose. Stainless steel automatic hose reel for 17m 1/2" hose. Stainless steel automatic hose reel for 20m 1/2" hose. Automatic hose reel "Nederman 884" for 20m 1/2" hose. 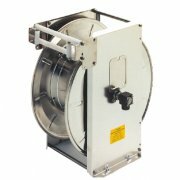 Stainless steel automatic hose reel for 25m 1/2" hose. 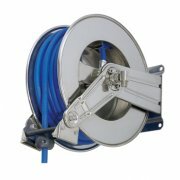 Stainless steel automatic hose reel "Nederman 884" for 25m 1/2" hose. 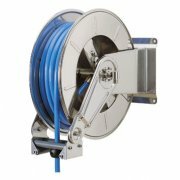 Stainless steel automatic hose reel for 35m 1/2" hose. Stainless steel automatic hose reel for 40m 1/2" hose. 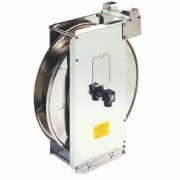 Stainless steel automatic hose reel for 60m 1/2" hose.